"I just figured if that was my house I definitely would want someone to put that fire out." 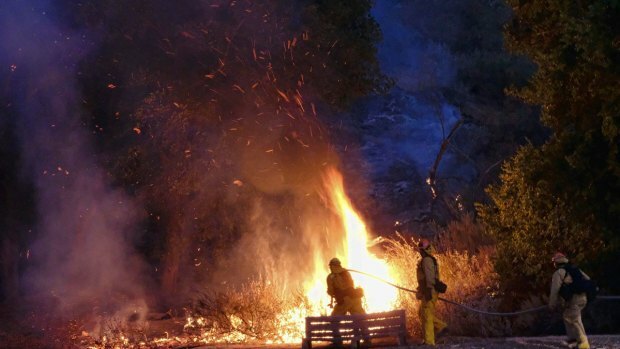 Two deputies said they were just doing their job when they jumped into action, grabbed garden hoses and began fighting the fierce Calabasas blaze themselves to protect strangers' town homes Saturday. "I just figured if that was my house I definitely would want someone to put that fire out," Los Angeles county Deputy Jesse Berg said. The Old Fire blaze erupted in the 2300 block of Mulholland Highway after a truck slammed into power poles, downing live wires and setting three small fires. As the three small fires converged into one massive blaze, homes were at risk across the Topanga and Calabasas area. During the height of the blaze, flames began riding up to the back of town homes in the evacuated Adamsville neighborhood. As two deputies began evacuating residents on a small cul de sac near a gated community at Blueridge Court and Adamsville Avenue, they realized the full scope of the fire. "There was a small fire that began climbing up a 50 foot pine tree," Berg said. "As soon as it started to go up, I figured the home is going to go up as well." They grabbed garden hoses and began trying to put out the flames themselves before firefighters arrived. Despite the ash, embers and water drops raining down on Berg and his partner, they continued on. "A couple of drops came down on us - thank you, LA County Fire," Berg said with a smile.